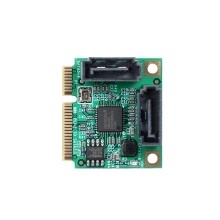 The Mini PCI-Express SATA expansion card can expand two SATA3.0 ports. With the native PCI Express 2.0 bus, the card supports SATA 6Gbps devices that conform to the SATA 3.0 specification and is backward compatible with SATA 1.5Gbps and 3.0Gbps devices. Support two SATA 6Gbps interface. Support hot-plug on SATA interface. Compatible with all computer systems with Mini PCI-E slot.